Molina Medicaid Solutions (formerly Health Information Management) specializes in the design, development, implementation, and operation of Medicaid Management Information Systems (MMIS) for state government agencies. It operates as fiscal agent, offering a variety of business process services including eligibility verification, member management, provider relations, claims processing, pharmacy benefit management, financial management, and program integrity. MMS is the third largest MMIS vendor. Synergy pursued a carve-out of this business unit from Unisys and entered into exclusive negotiations with seller for Molina Healthcare to acquire the business. 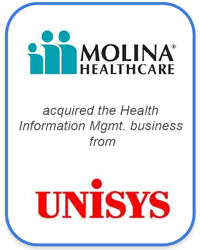 Molina Healthcare was interested in identifying complementary businesses to diversify from its health plan business. Unisys was interested in divesting non-core assets, as management was involved in a company restructuring and required liquidity. Synergy successfully negotiated this carve-out transaction with Unisys management on favorable terms for the acquirer (valuation multiples less than industry mean/median levels).